Early two Saturdays ago, Eric and I boarded the bus for Maracaibo. (Daniel left later in the day for Guasdualito). It was a fourteen hour ride and ten o’clock when we arrived and were picked up by our hosts. The length of our journey underscores the historic isolation of Maracaibo from the rest of the country, as it is on the west coast of the huge Lake Maracaibo. Indeed, with its sprawling geography, slower pace, heavy sun and dry, dusty terrain, the city does feel far from Caracas. As advertised, Maracaibo is hot: daytime temperatures are consistently in the mid-thirties with a fair amount of humidity. Contrary to my expectations, however, pretty much everything is air conditioned. But this does not stop all the locals from asking us, somewhat eagerly, with the same kind of idiosyncratic pride that some Canadians display at their cold winters, how we are handling the heat: a standard refrain to which we have learned simply to smile and nod politely. There are four Jesuits living here in a community next to Gonzaga College, the flagship institution in the city. A few decades ago it was moved from the well-heeled part of town to this poorer neighbourhood, not without some controversy. Fr. Daniel, the headmaster, gave us a tour of the school soon after we arrived. At several points he was accosted by parents who had come to ask him for spots for their children in the coming school year. As he explained to us later, the school only has about a hundred new places every year, and easily double the number of applicants. As difficult as it is to turn away a parent desperate for a superior education for his child―one mother was in tears when she approached him―he has had to become inured against these frequent applications. What can he do? The school is already full and running on a shoestring. On another day, we were shown around the city centre by one of the teachers, visiting the basilica, market and waterfront, and seeing the building where the representatives of the Spanish crown signed the final act of capitulation after losing the Battle of Lake Maracaibo in 1823. It was a surprisingly unassuming location, given its historical importance. I mentioned the Fe y Alegría educational network in a previous Impressions post, but only in passing. 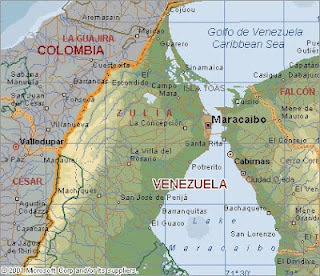 It is present in a large way in Maracaibo, and I continue to be astonished by its extraordinary reach. If the early Society of Jesus educated Europe in the early modern age, it is doing something similar today in Latin America. We have had the opportunity to visit a couple of the Fe y Alegría schools here in the city, but more eye-opening for me was the visit to the regional headquarters, a multi-storey building in the city centre which must employ dozens of staff. Here we saw the array of services that the organization offers. Besides the actual schools―which still comprise the main thrust of Fe y Alegría, there being over 170 schools in this country alone―there is an international radio network as well as an extensive adult-education programme. We got a tour of the radio broadcast centre from its national director. Within Venezuela they operate about a dozen radio stations across the country, providing a variety of programming, including their own news service; there are also radio stations present in many neighbouring countries. I was interested to hear some of the nuts and bolts of how they coordinate their national news between all the stations using a combination of satellite links, the internet and, when all else fails, the good, old-fashioned telephone machine. As the director was taking us past a recording studio, he paused to point out some awards on the corridor wall. During the 2002 coup attempt, Radio Fe y Alegría ended up being the only broadcaster in the whole country that was reporting any news of the events. Moreover, it did so in such a balanced manner―in contrast to the lesser journalistic standards prevalent in the country to this day―that the network was commended in the same year both by Chavéz’s government, which withstood the coup, and by the local government, which had supported the coup. The award certificates from each of these parties hang next to each other. We had a number of subsequent activities planned, but a few days ago I got slowed down by illness; a subsequent trip to the doctor ascertained that I had contracted strep throat. So I have been resting, convalescing, and letting the medicines do their work. I suppose it is easy to moralize when you have the benefit of good medical care, healthy food and a comfortable place to rest (because, on the other hand, ‘there was never yet philosopher that could endure the toothache’), so I am readily reminded of St. Ignatius’s words from the ‘First Principle and Foundation’ of the Spiritual Exercises. We should make ourselves indifferent to all created things, as far as we are allowed free choice and not under any prohibition. Consequently, as far as we are concerned, we should not prefer health to sickness, riches to poverty, honour to dishonour, a long life to a short life … Our one desire and choice should be what is more conducive to the end for which we are created. Moreover, there is something romantic about falling ill in a tropical country, at least in small doses. One thinks of Darwin and other explorers being temporarily waylaid on their excursions. (On the other hand, one tries not to think of Tony Last helplessly stranded with Mr. Todd.) When I have not been resting, I have been reading Shirley, listening to Bramwell Tovey explain Beethoven’s sympthonies;and every now and then, when my mind is a bit sharper, writing Python bindings for aephem—and, of course, I have used my reserve forces to write this web log entry. It should be my penultimate Impressions from Venezuela, for in less than a fortnight we return, God-willing, to Canada.